You can delete one group or a group set (which removes all the groups in that set). Once the group has been deleted, the group and all work done in that group cannot be retrieved. 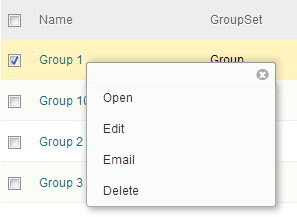 Step 1: From the Groups page, click the drop-down arrow after the group name and select Delete. Step 2: If you are sure about deleting this group, click OK. Step 2: Click the drop-down arrow after the group set name and select Delete. 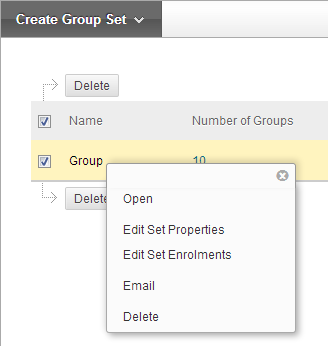 Step 3: If you are sure about deleting all groups in this set, click OK.
Edit the group or group set and select which tools will be available to members of the group. Step 1: From the Groups page, click the drop-down arrow after the group name and select Edit. Step 2: For Tool Availability, select which tools will be available to members of the group. 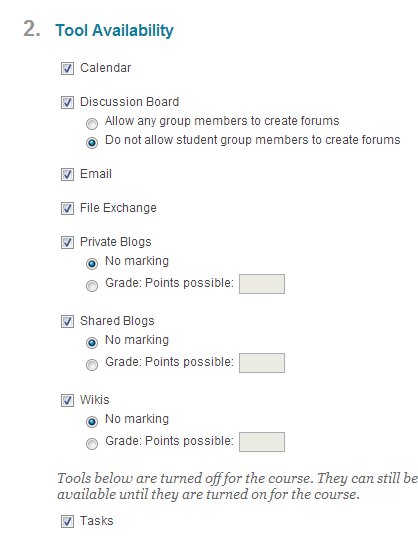 File Exchange: Users within the group and the instructor can upload files to the group space and organise them through the creation of folders. Step 2: Click the drop-down arrow after the group set name and select Edit Set Properties. Step 3: For Tool Availability, select which tools will be available to members of the groups in the set.